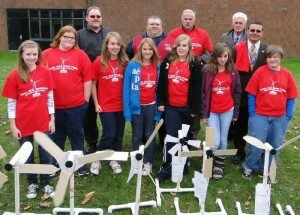 OSWEGO, NY – A “Tool Box Wind Fair” blossomed in front of Oswego Middle School recently as the result of a $5,000 Lowe’s Tool Box in Education grant to focus on the alternate energy curriculum with an emphasis on wind energy. Seventh and eighth grade students proudly displayed their work. Joining in the celebration are (in front) Erin Meehan, Kate Shaw, Becca Victory, Alyssa Laskevicz, Meghan Hourigan, Cassidy Quone and Ed Haynes. In back are Lowe’s store manager Troy Fowler, Lowe’s commercial sales specialist Chris Miller, teacher Fred Ensworth, board of education president Dave White and Oswego Superintendent of Schools Bill Crist.